On December 23, 2015, as Christians prepared to celebrate the birth of Christ – the child of refugee parents who sought safety in a stable, the Department of Homeland Security announced plans to enact raids in communities across the U.S. to deport Central American children and adult asylum seekers. These families sought refuge from horrific violence and poverty facing El Salvador, Guatemala, and Honduras. Those being targeted, entered the United States seeking asylum and have had a final order of removal since January 1, 2014, including children and families who lost their asylum cases because they were unable to find adequate legal counsel, as well as individuals who were given deportation orders in absentia or through “rocket dockets” that are meant to expedite trials but in reality deny due process. The New York Times reported yesterday that 121 people have already been apprehended and will soon be deported. Sadly, at the same time the news from Central America continues to be grave — in El Salvador homicides increased 70% in 2015. Earlier this week the Jesuit Conference of Canada and the United States released a statement calling for the end of these raids and ISN and Jesuit Refugee Service USA joined other NGO’s calling for protection of asylum seekers. 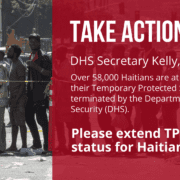 Join the Ignatian Solidarity Network and Jesuit Conference, send a message to the Obama Administration — end the use of raids, allow asylum seekers due process, and use U.S. influence to promote human rights in Central America. As the celebration of the Christmas season comes to an end, thank you for carrying on the spirit of this holy season by standing with refugees and asylum seekers. Jesuit Volunteer Reflects: Why can't they just wait in line?